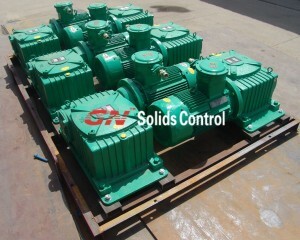 GN solids control is seeking for a reliable and powerful partner who makes mud tanks in Latin America, we will provide solids control equipments and when tank is ready, you can install it on the tank. Because of the long distance shipment from China to Latin America, and the high import tax of mud tank, the economic way is to make the tank by local mud tank manufacture and installed with GN equipments. We will have a technician for instruction of installation. Agitator mixer uses an impeller to mix and suspend the solids using both axial and radial flows, and by utilizing low shear mixers to suspend and mix mud additives particle size degradation and polymer shear. Unlike centrifugal pumps or mud guns. The Mud Agitator is relatively low shear and low energy device, so it’s easy to operate and inexpensive to maintain. This will ensure that mud additives are homogeneously mixed to prevent dead spots. Agitators will keep the active mud system flowing even when the pumps are disengaged and keep the weighting agents in suspension. – Increase performance of solids removal equipment. – Maintain a uniform mud density. – Prevents solids settling , taking up valuable tank displacement. – High shear mixing, aids chemical and solids addition. – Quiet, smooth, vibration free. – Durable, single reduction worm gear drive. – Fewer moving parts, less maintenance. – Direct, flexi-couple drive system. – Explosion proof electrical system. – 50% better shock resistance than helical and bevel gears. GN agitator mixer and agitator tank has been exported to more than 40 countries in the world, welcome to inquiry or discuss for cooperation in Latin America.